It is a sad fact that an air conditioning system is a great contributor to the high energy consumption of your home. But what can we do? It is the one that saves our comfort during the long, hot days. But what if you realize that your energy bills have been increasing dramatically over the past years? What if you noticed that your consumption this year is unusually higher than last year? We understand your eagerness to know how these changes happen, especially that we are referring to energy usage and dollars here. 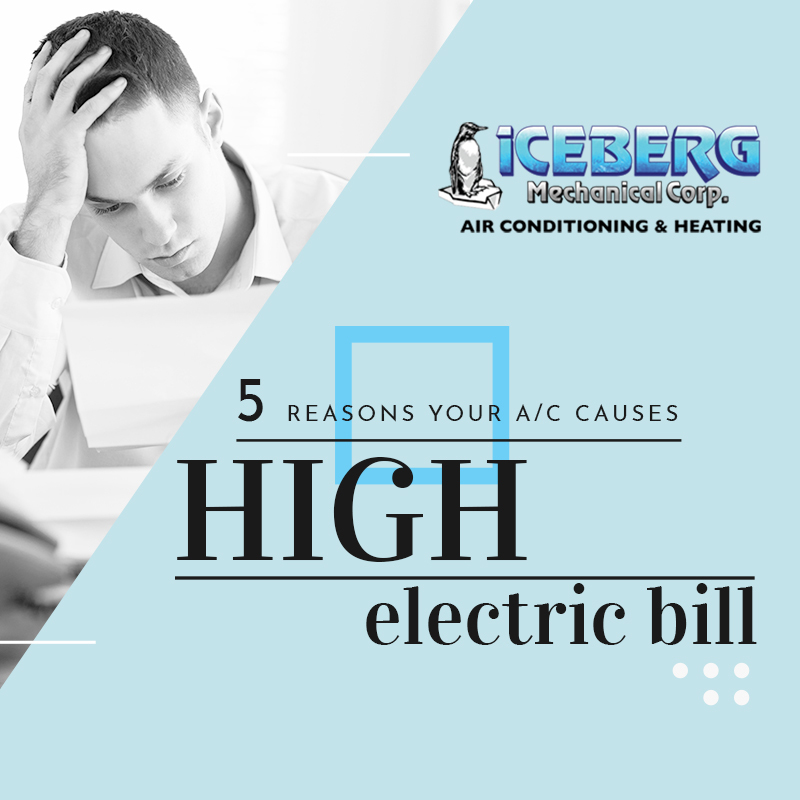 To help you sort things out, here is a list of the major reasons why your A/C causes high electric bills and what you can do about it. An air filter that’s filled with dust and dirt hinders the proper flow of air. As a result, it takes too long for your unit to cool your home. And the longer your air conditioning system runs, the more electrical energy it consumes. Replacing air filters every 1-3 months is the easiest maintenance check that you can do to save yourself from skyrocketing energy bills. The duct is the passageway of the conditioned air towards your home. The presence of leaks in this part of your system allows the cooled air to escape. The conditioned air that flows out of the system is already a waste of money, and since your system needs to run harder and longer to suffice the demand of the thermostat, you will surely be faced with an excessively high electric bill to pay. Get professional help to seal those leaks before it is too late. The motors, capacitors, compressors and all other mechanical parts of your unit play an important role in its proper operation. Failure of these components can lead to system inefficiency which is a common cause of high energy consumption. With maintenance service, you can be sure that these parts are running in tip-top shape. If you have an insufficient amount of refrigerant inside, your system will function at low performance. This also means harder and longer cooling for your home. Low refrigerant simply portrays that leaks are present in your system. Let the expert find those leaks and seal them before adding up the right amount of refrigerant in the unit. A poorly maintained A/C functions inefficiently and is more prone to system breakdown. The malfunctioning parts are the ones that cause your system to use more electrical energy than needed. Schedule a regular A/C maintenance service to make sure that your unit and its components are in good condition all the time. If it’s the same issue that is troubling you today, Iceberg Mechanical is just around the corner to assist you. Schedule an appointment with our experts, and we will diagnose and fix the issue fast and right.